As our Indianapolis weather begins to gradually warm, many residents begin the annual migration from enclosed shoes to sandals. Sandals feel cooler in the warm weather, and are easier to slip on and off. Summer and sandals go hand in hand. Unfortunately, some people have a much higher chance of gradually injuring their feet, especially the heels, while wearing sandals. This injury may not even be felt until the fall, but can cause pain and activity limitation nonetheless. Here is some quick advice to avoid heel pain by being sensible with one’s choice of sandals. The fact of the matter is that many sandals are not very supportive. Most sandals have flat or thin soles, and flip flop sandals in particular do not stay on the foot well. This can lead to gradual strain to a ligament on the bottom of the foot called the plantar fascia. Once strained, this ligament becomes inflamed and can tear microscopically, leading to more significant pain after a while. People with lower or higher arches are more likely to injure the plantar fascia, although people with ‘normal’ feet can do so as well. An easy solution to avoiding this strain is to select sandals that are better constructed to contour the arch and lend more support. Many newer models of sandals, from fashion to sport, come with a raised arch bed that cradles the arch and reduces strain to the plantar fascia. Flat sandals should be avoided, as should inexpensive flip flop sandals outside of the pool or beach. Anyone with a history of foot pain should be especially careful in their selection of sandals. If you do develop heel or foot pain after wearing sandals, it is important this be treated as soon as possible. Many people make the mistake of assuming this pain will go away on its own, when the fact is the pain will likely remain for months or longer. 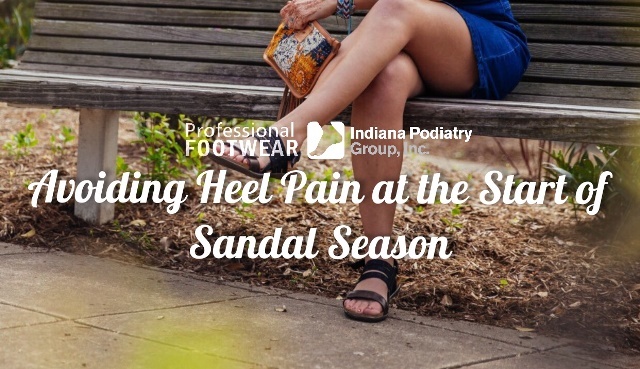 Be sure to give my office a call to be seen if you have any questions on what kind of sandal or footwear is right for your foot, or if you start to develop heel or foot pain over the course of this summer.